Another WolfCop is a fury of fun, and this is coming from someone who hated the first movie. Talk about a switcheroo. This lark-of-a-sequel packs the insanity I was anticipating in its lacklustre 2004 predecessor, a film that took itself way too seriously. It seems that writer/director Lowell Dean has realized that WolfCop himself is a concept, not an entire movie. That’s where the first one faltered for me. The idea of an alcoholic cop who turns into a werewolf during after hours is a thin joke, which made Dean fall back on crime tropes to get his movie from A to B. Clearly, Dean was more focused on establishing WolfCop’s origin story. 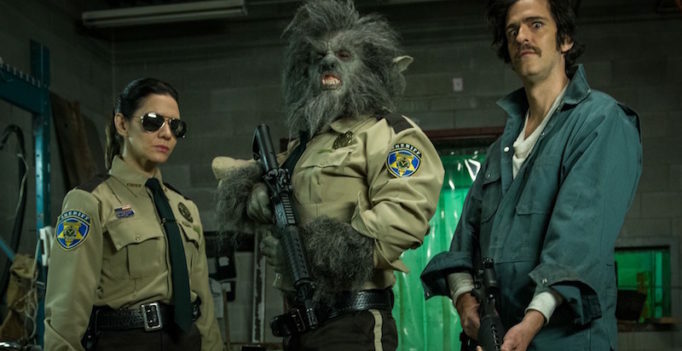 If WolfCop was obligatory groundwork, Another WolfCop is that very same filmmaker exploring the limits to his character and dropping him into a brash world ripped right out of a comic book. 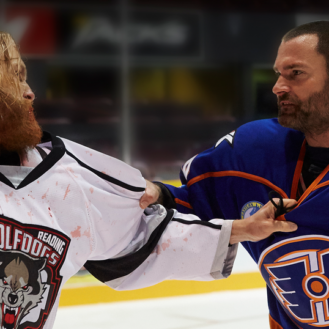 Another WolfCop is a sequel in the same spirit of Crank: High Voltage in the sense that it throws everything at the wall and doesn’t give a…well, let’s leave the colourful vocabulary to the movie. It’s also a film that has the exaggerated gusto of a Troma movie, meaning that everyone making the sequel is wanting to meet the film’s level of audacity and is fearless in doing so. This applies to returning cast members like Leo Fafard (Lou Garou/WolfCop), Jonathan Cherry (lowly sidekick Willie Higgins), and Amy Matysio (loyal officer Tina), but also new participants like Serena Miller as Willie’s younger sister, Murdoch Mysteries’ Yannick Bisson as the film’s slick and nefarious villain Sydney Swallows, and Tusk filmmaker Kevin Smith as the city’s dim mayor. Another WolfCop is an exception to the rule of comfort and decency. In order for it to impress its audience, it has to go big or go home. With its inventive kills, its buckets of blood and gore, its excessive nods to Canadiana, ridiculous sensuality, and surprising puppetry that fuses elements of Alien with twisted nostalgia for 90s-era PSAs, the film succeeds. It’s an over-the-top and crude flick but, then again, it’s hard to deduct marks from a movie that set out to be those things in the first place.